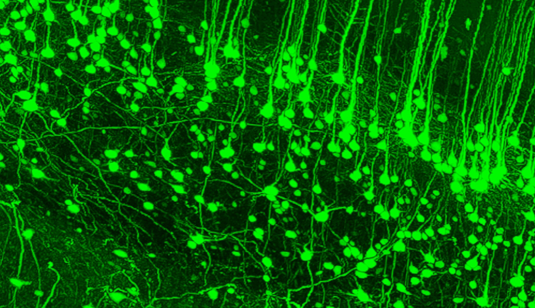 Neuronal structures at subcellular resolution in the cortex. Lesions caused by traumatic brain damage, stroke and functional decline due to aging processes can disrupt the complex cellular network that constitutes the central nervous system, and lead to chronic pathologies, such as dementia, epilepsy and deleterious metabolic perturbations. “How exactly this happens is completely unknown,” says Dr. Ali Ertürk, who heads a research group at the Institute for Stroke and Dementia Research at the LMU Medical Center. Ertürk and his team previously developed and have now refined a novel imaging technique that allows them to visualize and monitor these structural alterations in neuronal networks. The new findings appear in the journal Nature Methods. Because essentially all cell types – including immune cells and tumor cells – can be specifically labeled with the aid of appropriate fluorescent markers or antibodies, the new method can be employed in a broad range of biomedical settings. “Since it allows individual cells to be localized, the method could be used to detect and characterize metastatic tumors at an earlier stage than is now feasible, or to monitor how stem cells behave in the body following a bone-marrow transplant,” says Ertürk. Furthermore, the images obtained can be archived in a database and made available to other researchers, which should help reduce unnecessary duplication of studies. Ertürk and his colleagues are already planning to assemble such an online archive.